Rotary engines: for years, it has been prophesied that they will return to deliver salvation to the faithful. One day, it is said, they will be back. Any day now. For real! And we totally believe it. The latest round of rumors out of Japan promise us a new 450 horsepower Mazda rotary coupe by 2019. As breathlessly reported by Motor1, the internet hears tell of a new sports car we’ll see at the 2017 Tokyo Motor Show. 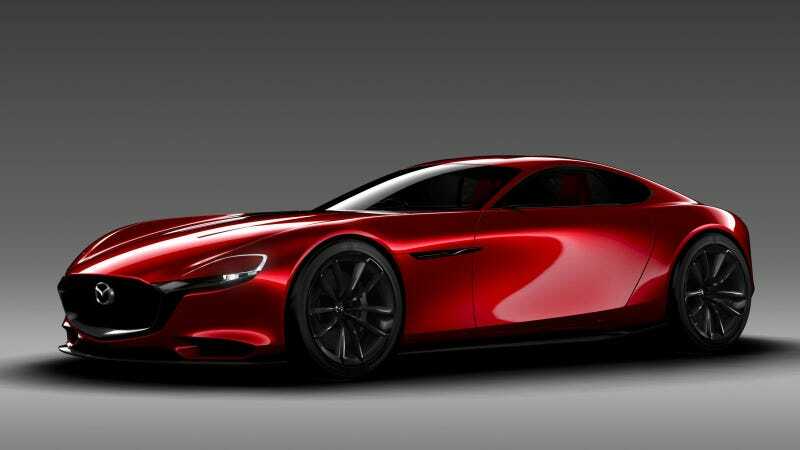 Its looks are said to be based on the stunning Mazda RX-Vision Concept from a couple years back. I’ve seen that concept in person and it’s one of the better-looking sports car designs to come along in recent years. The power train to worry about is 450 ps, ​​the newly developed rotary engine “SKYACTIVE-R” FR, the body size is expected to be 4440 mm in total length, 1910 mm in full width, 1180 mm in total height, 1300 kg to 1350 kg in weight. The last part is pretty important because it puts this sports car—which is totally happening (suggestive wink)—under 3,000 pounds, making it a true lightweight among the beefy sports cars we have now. After all, it’s not like the rotary engine—while fun and high-revving and generally kickass—has any sort of major inherent roadblocks to future production, like high emissions and fuel consumption and fragile apex seals, that might keep it out of production. Nope. None at all. I’m thinking this one’s a lock, everybody. The report also says this could be Mazda’s most expensive car ever, with a price tag of 10 million yen, which is about $90,000 in the U.S. Car prices rarely directly translate from country to country, but this gives us the idea that it won’t be cheap. So start saving up your money now, because this is definitely happening!!!! If you can’t trust unsourced rumors in Le Volant Boost, what can you trust?